SUV crashes through wall of Walgreens store in New Castle, Del. NEW CASTLE, Del. 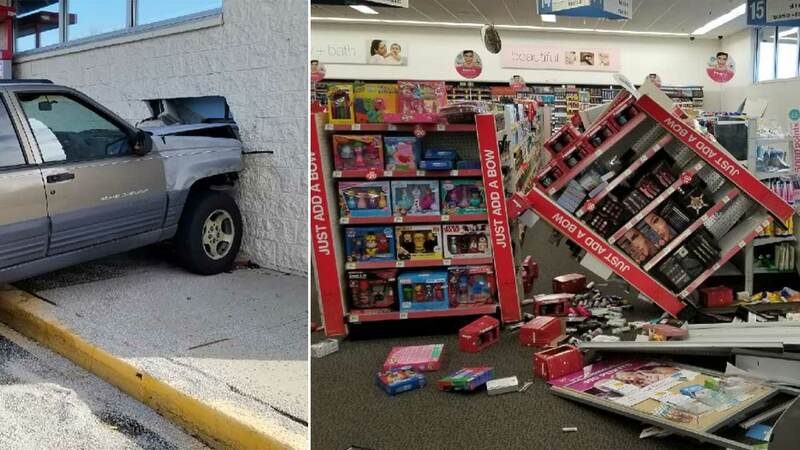 (WPVI) -- A driver has been cited after she crashed her SUV through the wall of a Walgreens store in New Castle, Delaware. The crash happened around 9:50 a.m. Friday at the store in Beaverbrook Plaza. According to investigators, 65-year-old Joyce Ann Jones failed to stop while pulling into a parking space, striking the building. Photos provided by police show a hole in the building where the vehicle hit and knocked over shelves inside the store. Jones and a 66-year-old male passenger in the Jeep were being treated for minor injuries. The Walgreens had to be evacuated after officials determined the structure was not safe. It will remain closed until repairs can be made, police said.